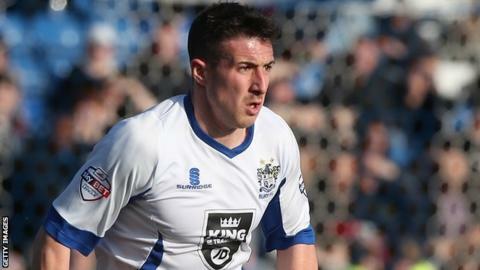 Craig Jones' goal earned Bury their first league win of the season and ended Walsall's unbeaten start. The Saddlers claimed a draw and four consecutive wins in August, and went into Saturday's game top of the table. But they were undone by Jones' sixth-minute strike, which he powered low into the net. Walsall pushed for an equaliser, but Shakers goalkeeper Rob Lainton produced a string of saves to make sure his side went away with all three points. "I can't have asked any more of the players, they gave it their all. "We didn't start the game very well and we got punished by a decent goal from them but, for half an hour in the first half it's as well as we've played this season so far. "It was a good finish from them but looking back we know we could have defended it better." "It was the ultimate team performance, in everything we did. "In a good film, you never remember the start of the film, it's only ghosts that remember the start of the film and you always remember the end. "At the start of the film today we played some good stuff ourselves, we were unplayable and caused a lot of problems. "It was a tough game today but that's the way football is." Match ends, Walsall 0, Bury 1. Second Half ends, Walsall 0, Bury 1. Attempt saved. Tom Soares (Bury) right footed shot from the centre of the box is saved in the top right corner. Attempt missed. Tom Bradshaw (Walsall) left footed shot from the centre of the box is too high. Attempt saved. Sam Mantom (Walsall) right footed shot from outside the box is saved in the top centre of the goal. Attempt saved. Kieron Morris (Walsall) right footed shot from the right side of the box is saved in the top centre of the goal. Attempt missed. Danny Pugh (Bury) left footed shot from the centre of the box is close, but misses to the left. Danny Pugh (Bury) is shown the yellow card for a bad foul. Hand ball by Danny Pugh (Bury). Foul by Rico Henry (Walsall). Corner, Walsall. Conceded by Tom Soares. Attempt missed. Kieron Morris (Walsall) right footed shot from outside the box is close, but misses to the right. Substitution, Walsall. Kieron Morris replaces Reece Flanagan. Substitution, Bury. Danny Pugh replaces Jacob Mellis. Substitution, Bury. Tom Pope replaces Leon Clarke. Attempt missed. Tom Bradshaw (Walsall) header from the centre of the box is just a bit too high. Corner, Walsall. Conceded by Nathan Cameron.